So, how is gender distributed among the Brainfooders? 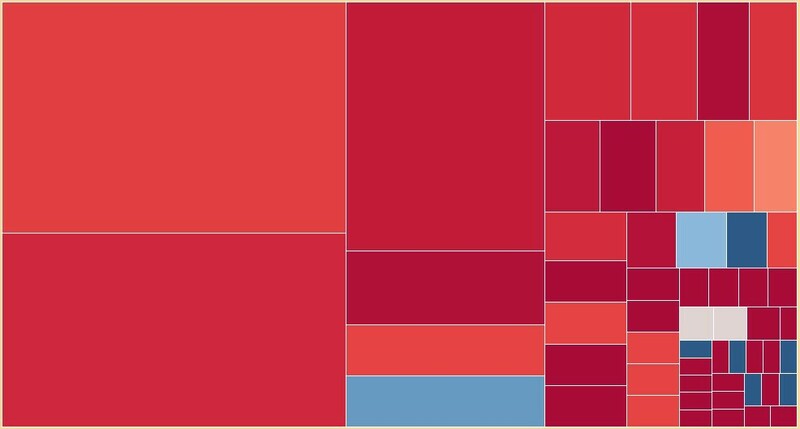 This week’s read brings you another treemap however with a focus on the gender breakdown of the Brainfooder community across countries. We will also see how gender breakdown compares among different job categories. The last edition’s treemap does look chaotic in comparison. 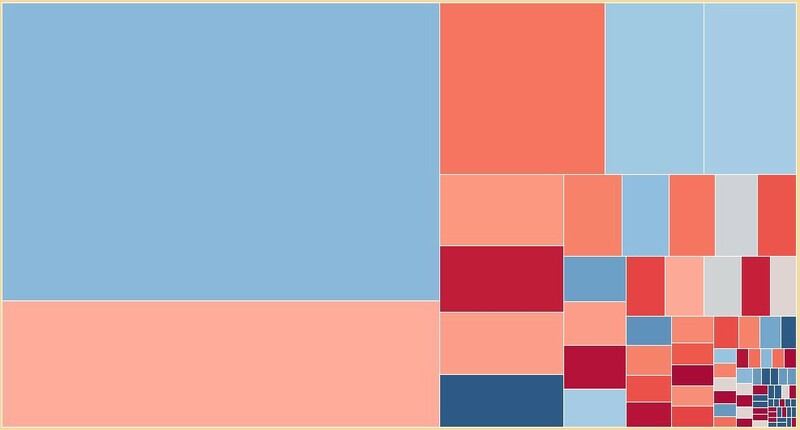 Each block on the treemap above represents a different country, with its size representing the size of the population. For visualisation purposes, the very unique colour palette of red and blue is used, where dark red reflects a high female-to-male ratio and dark blue a high male-to-female ratio. 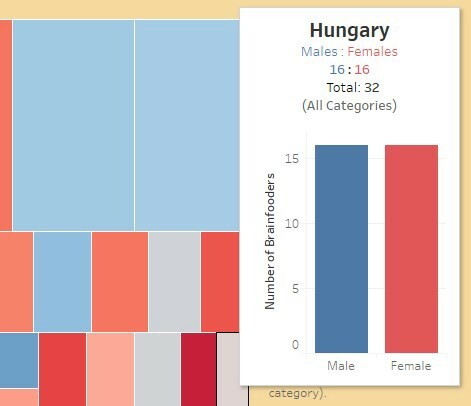 Clicking on the treemap will take you to an interactive version on Tableau which will allow you to see how gender is distributed within your country among the different job categories. Looking at the Brainfood community as a whole produces the treemap shown above. With neither red or blue dominating the map, it appears that the Brainfood is enjoyed by males and females alike when observing across countries. The UK, the largest population, has a male-to-female ratio of roughly 3:2 with 1626 males and 1071 females enjoying the Brainfood — this is reflected by the largest blue square in the treemap. The Netherlands and Australia follow a similar pattern to the UK with a larger proportion being made up of males while USA and Germany show the opposite with more females than males in their Brainfood population. Hungary, as shown by its neutral grey block, takes the crown for the largest equal Brainfooder population with 16 males and 16 females currently subscribed. Meanwhile, the Brainfood is making more of an impact among the female gender in Poland with 132 females subscribed vs. only 41 males. India has the highest male-to-female ratio with 102 males enjoying the Brainfood vs. only 34 females. 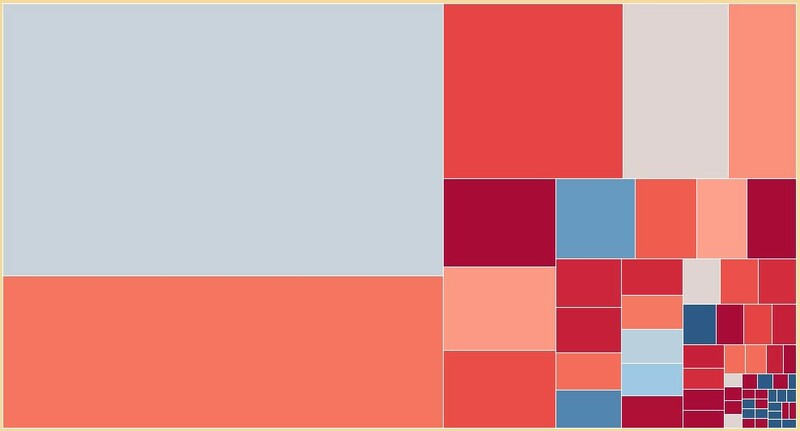 Focusing only on internal recruiters, the breakdown by country provides a different story with noticeably more red than there is blue on the treemap above. 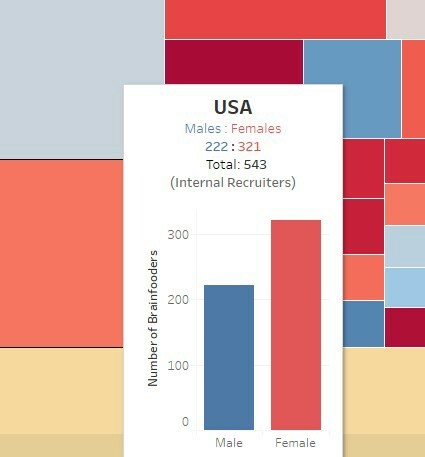 As indicated by the pastel blue shading, the largest group of internal recruiters (UK) does have slightly more males than females - 503 vs. 466 respectively. However, beyond that, the majority of countries show a female dominated internal recruitment population. Majority of countries show a similar trend within internal recruitment. The second largest group of internal recruiters is that of the USA which has a female-to-male ratio of almost 3:2. Germany, Australia and Canada are notable populations that also have more females than males enjoying the Brainfood. The prize for equality in this category goes to the Netherlands which has a split of 75 males and 75 females enjoying the Brainfood. Poland’s high female-to-male ratio is emphasized in this category with a ratio of almost 6:1 while Hong Kong in contrast has the highest male-to-female ratio within internal recruitment with 10 male Brainfooders compared to just one female! 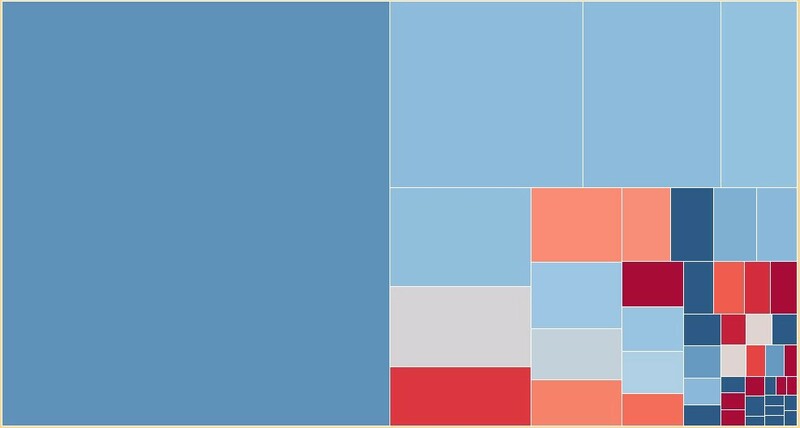 In contrast to the internal recruitment treemap, what we get from looking only at agency recruiters is quite the opposite, with blue dominating the picture. The male-to-female ratio for the UK is greater than 2:1 in this category with 561 males and 265 females enjoying the Brainfood. Having worked as an agency recruiter myself, this ratio probably sounds about right. The next largest populations (USA, Australia, Netherlands, Germany) with lighter shades of blue show a slightly less unequal distribution in comparison. In Ireland, there is an almost equal split with 29 male and 28 female subscribers, while Poland’s female dominated Brainfood population is maintained even when focusing only on a more male dominated category. Now it isn’t breaking news to learn that HR is more female-dominated compared to other industries but we can see the extent of this across different countries within the treemap above. Focusing only on HR professionals within the Brainfood community provides us with a picture that is almost free of the colour blue. UK (again the largest population in this category) this time has a female-to-male ratio that is greater than 2:1 with 95 female and 46 male HR professionals enjoying the Brainfood. Poland again has more females than males within the HR category but doesn’t stand out this time around. The largest populations all the way down to India follow a similar breakdown as demonstrated by the abundance of red blocks. India’s male-dominant Brainfood population overall is shown here with 12 males and 6 females in a highly female dominant category. The ‘Vendors’ and ‘Others’ categories provide a more male-dominant treemap, showing a similar pattern to the agency recruitment category. The Brainfood community as a whole appears to be distributed evenly in terms of gender across different countries. However, when we filter by the different categories, regular patterns do occur. Though not the case for every country of course, females outweigh males by number within internal recruitment and even more so in HR. While the other categories, in particular agency recruitment, are the opposite and are more male-oriented. How does your country fare? See for yourself by clicking on this interactive map and check out what the gender distribution is like in your country. If you have enjoyed this post or alternatively want to give some feedback, then please feel free to send me a message! You can also explore the ‘Brainfooder World Map’ and the ‘Brainfooder Top Employers’ by clicking on the links. What I plan to do next? This is the third of a series of visualisations surrounding the Brainfood community. Be sure to follow me on Medium or LinkedIn to see what other insights are to come. 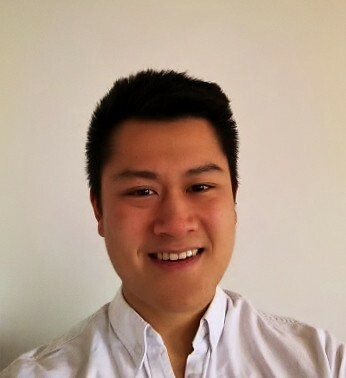 Stephen Li is working with data as an intern at Recruiting Brainfood — the weekly newsletter for the talent industry. Feel free to connect on LinkedIn and start a conversation — all it takes is ‘hello’!